30 years on because of catalogue sale and resale, A Time Of Changes is lost in the vaults of corporate hell and may never see the light of day again. 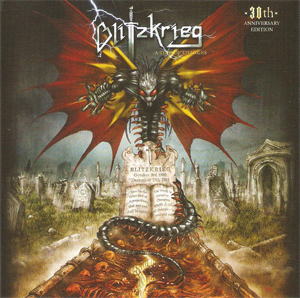 That said the current lineup of BLITZKRIEG wanted this album available to fans so they have completely re-recorded the album and added two bonus tracks. “Too Wild To Tame”, which should have made the LP back in 1980 but for time restrictions of vinyl then would not fit, was eventually recorded by another Neat records stablemate, AVENGER. The second bonus track has never been released before though written at the time. “Jealous Love” was the last song penned by the Ross/Sirroto partnership which fueled the early version of the band. All the classic tracks are here too on this album including many still played live today, which includes the METALLICA-covered “Blitzkrieg” track. It also features guess twin guitar appearances on “Pull The Trigger” by SATAN's Russ Tippins and Steve Ramsay. Great new artwork has been commissioned for the new version by South American artist Ivan Chacon fronting a new 12-page booklet full of sleeve notes by Brian Ross, lyrics and new photos from the past and present lineup. The album will be released in Europe by the band's long time label, Metal Nation Records. It will also be released in Japan by Spiritual Beast and various labels in South America to coincide with the band's 15-date four-country tour in November 2015. There will also be a vinyl version of the album by German based label High Roller Records.